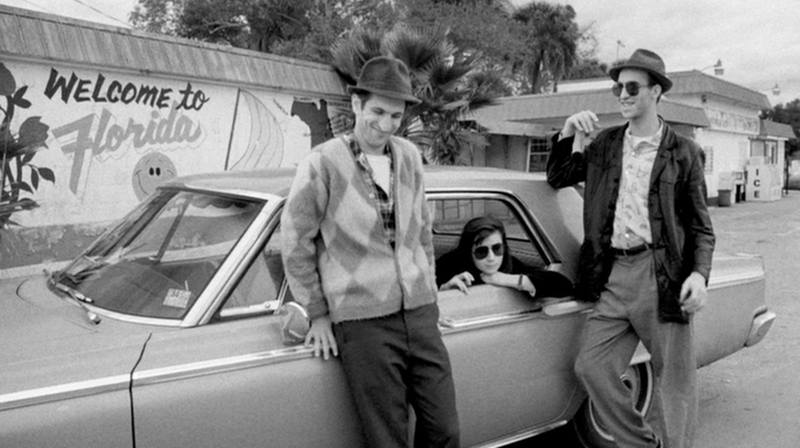 The oddest thing about Stranger than paradise is that it is not strange at all. It might look strange to some, being a modern black and white movie. It might sound strange to some with a piece of music especially the line "I put a spell on you" being repeated over and over. But it is not any stranger than the everyday life that we live. Meet Willie (played by John Lurie) an immigrant who is trying really hard to become an American. He watches football. Likes to speak English and prefers to dress like the locals. He has lost touch with his family and his country. Expect for aunt Lotte. One day aunt Lotte calls him. She asks him to allow his cousin to say with him for a while. Willie hesitates but she would hear none of it and that is that. Meet Eva (played by Eszter Balint). Willie's 16 year old cousin. Just as aunt Lotte told she comes by , one day, to Willie's apartment. Reluctantly Willie lets her in. But he is cold and distant towards her. Eva on her part is not too fond of him either. The turning point in their relationship comes when Eva steals grocery from a local shop after which Willie warms up to her. As they get to know each other they discover that they are not much different after all. Meet Eddie (played by Richard Edson). Willie's friend and partner in crime. From the beginning he his much more friendlier to Eva than her brother. He even asks him to take her to the movies with them but Willie says no. Soon Eva's time at the apartment comes to an end and she decides to leave it to go to aunt Lotte's place. Willie brings her a parting gift. A nice dress just like the American girls like to wear. Eva does not like it but after much insistence puts it on just to please Willie. Only to throw it away outside his apartment. Cold but that is just how she is. An year passes. Willie and Eddie have swindled few men in poker and have now in their possession some hefty cash. They decide to visit Eva at aunt Lotte's. Eva is very happy to see them and decides to show them around. But there is nothing much to see with everything freezing this time of the year. Their conversation with Eva reveals that she is quite bored there. So Eddie suggests that they go Florida. Aunt lotte takes some convincing but in the end they set off to Florida. In Florida Willie and Eddie blow up all their money on a horse race. Infuriated, Eva leaves them while they are away to "fix things". She buys a hat for herself and just starts walking. The local gangster mistakes her for some one else and hands her a stack of cash. Just like that. Eva returns leaves some money for Willie and Eddie and a note saying that she is returning to her native land having had enough of America. Meanwhile Eddie and Willie's exertions pay off and once more they come into possession of cash. They return only to find that Eva has left. Willie runs after her and boards first flight to Hungary. But Eva on the other hand never boards a plane and returns back to their motel instead. And that's the plot for stranger than paradise. I would say that stranger than paradise is different than most movies because it is so quiet. Nothing interesting ever happens in the movie. Yes Willie and Eddie are thugs but they are just regular thugs. They never engage in street fight or anything that thugs in other movies do. The movie does not even have a story per se. It is just scenes that melt into each other,one by one flawlessly, leading to a satisfying and for some a strange ending.